Who really invented the Ultradyne? From the diagram it is clear that the tube 3 is the mixer, where the winding 7 picks by induction, from the winding 6, the oscillating voltage from the oscillator thus feeding the anode of the mixer. The local oscillator signal is generated by the tube 4 and is amplified by that numbered 5. The beat is picked up in the terminals 8 and 9. The interesting fact is that in the text of the German patent the mixer 3 is described as a tube that serves as an amplifier and interrupter, this is, without question, a much better explanation than those of Jouaust and Lacault, and confirms what I have written on the actual working of the Ultradyne (Ref. 2). There is no doubt that already in 1920 the switching mixing system was in the air! The patent application is dated August 10, 1920, then about 10 months earlier than that of Jouaust which is from June 22, 1921. Sometimes it happens that the same (or similar) invention arises in the mind of some inventors in different times and places. 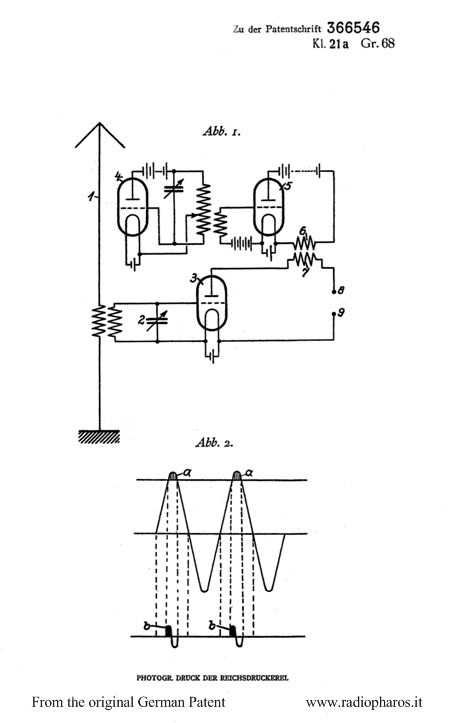 1- From a better translation of the original text of the Telefunken patent it argues that the circuit was designed to be used not solely for a shift of the antenna RF signal into the Audio band (Heterodyne) but also to a first conversion in the "Medium Frequency" and then in audio, therefore with the concept of the superheterodyne. Not only that, but to avoid "interferences" it was proposed to use the same type of circuit in several frequency conversions in cascade! The text of the patent shows another peculiarity; the function of the tube 5. This tube rather than amplify the oscillator signal turned it into impulses! The interrupter tube (3) plate received these short pulses through the coil 7. According to the inventor(s) that caused an amplification.